Three Stunning Card Effects, each involving holes. A super visual sandwich! A signed card which was lost into the center of the deck suddenly appears between two blank cards, one of which has a hole in it, as they are waved over the deck, the spectator actually sees their card arrive through the hole! Extremely visual. Easy to do. Resets automatically. Special cards included. Any card (no force) is signed from a genuinely shuffled pack before being lost into the center of the deck. A second indifferent card has a hole punched through it. The hole is visibly removed from the indifferent card and tossed into the deck. The deck is spread and the signed card is now face up in the middle of the pack. As it is slowly pulled from the pack it is seen that the hole is now on the signed card! No special preparation, no gimmicks, and can be done with a borrowed shuffled deck. Nothing added or taken away, this one is a real stunner! A selected card is placed on top of a shot glass and a coin is handed out. The audience is challenged to get the coin into the shot glass, but it's not that easy, there are some conditions. Whether they succeed or fail, a magical solution is presented. 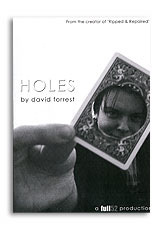 A 'portable hole' is attached to the card, which then becomes a real, honest to goodness, hole! The coin can then be dropped through the card and into the glass. An extremely engaging, eye-popping routine that is very easy to do.